<b>RUN FOR FUNDS:</b> The author shucks and jives past the Brunettes’ defensive line in last year’s showdown. The powder puff may be best known as a go-to staple in any woman’s makeup bag, but it’s taken on a significantly new meaning to me: FOOTBALL. I realize some think that our brand of flag football lacks the intensity of the tackle version, but when I take the field this weekend in front of more than 500 fans to keep the timeless rivalry of Blondes vs. Brunettes alive, there’s no difference to me. I’m a proud member of Team Blonde, and we’ll be stepping onto the well-groomed fields of the Santa Barbara Polo & Racquet Club on Saturday, July 18, to defend our title in the Second Annual Blondes vs. Brunettes flag football game, hosted by the California Central Chapter of the Alzheimer’s Association. Team Blonde’s brutal battle to victory in last year’s inaugural game was unlike anything I had ever experienced in my 20-plus years of competitive sports: As a running back, the first play of the game sent me face-first into the grass after I dodged a steady stream of brunettes, and that adrenaline rush never stopped as I endured elbows, scratches, and tackles all the way to the end zone. But expect even more flags to fly this year, for both teams have been fine-tuning their game plans over the past few months while adding new players, coaches, and strategies. More important than the win is the why: The Blondes vs. Brunettes clash was created nationally by the Alzheimer’s Association in 2005 to increase awareness for a new generation around the disease, which affects twice as many women as breast cancer. Games are held year-round in more than 35 cities, so far raising more than $5 million dollars. We’re now selling tickets with hopes to raise $65,000 for this match, all to benefit care, support, advocacy, and research efforts. So come watch our athleticism speak for itself. I’m confident you’ll see that blondes do have more fun, but this isn’t about who’s smarter or more exciting: It’s about who can score the most touchdowns and win! Then when the 2015 champion is crowned, we can slap each other’s backs for coming together to support a great cause. 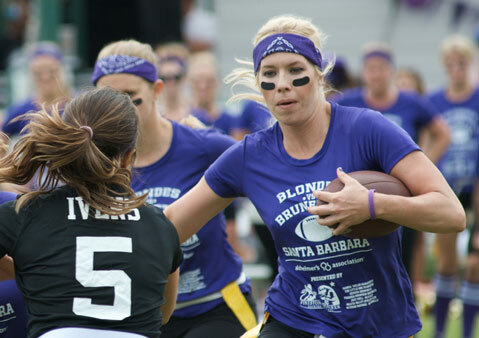 The Blondes vs. Brunettes flag football match is Saturday, July 18, at the Santa Barbara Polo & Racquet Club. Tailgate starts at 11 a.m., and the game is at 12:30 p.m. Tickets are $25, but kids get in free. See act.alz.org/BVBSB.